The Twelfth Enchantment is the most captivating work to date of a master literary conjurer. David Liss is the author of "The Devil's Company, The Whiskey Rebels, The Ethical Assassin, A Spectacle of Corruption, The Coffee Trader, "and" A Conspiracy of Paper, "winner of the Edgar Award for Best First Novel. He lives in San Antonio with his wife and children. 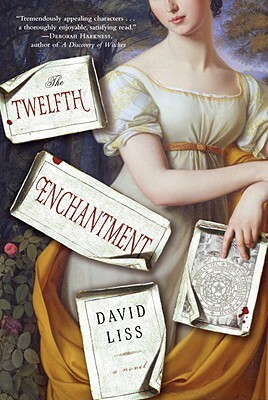 "David Liss takes readers on a light-hearted romp through Regency England in The Twelfth Enchantment. With an adroit mix of fact and fantasy, Liss casts heroine Lucy Derrick into a world of industrializing mill towns, mysterious enchantments, ghostly dogs, undead fairies, Luddites, and even Lord Byron and his legions of lovesick women. Charged with gathering the scattered pages of an alchemical manuscript, Lucy’s adventures teach her that appearances can be deceptive—and delightfully so. Liss’s deft touch with historical subject matter and his ability to craft tremendously appealing characters makes this a thoroughly enjoyable, satisfying read."